The brand Dakine would not exist today if there hadn’t been a special guy: Rob Kaplan. It was thanks to him that the label was created and that it belongs to world’s most well-known manufactures today. All began in Hawaii. Now for hundreds of years the residents have set about surfing. Modern surfing is rooted in Hawaii. Rob Kaplan could also not escape from it and surfed in the big waves of Maui with great pleasure. Owing to the rapid pace of developments in surfing in the 70s Rob Kaplan started to develop first leashes for surfboards. He wanted to fulfill the particular requirements. 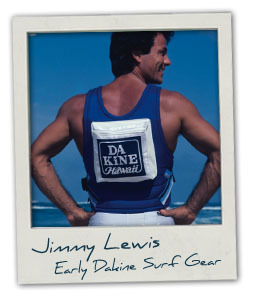 As a result he founded Dakine in Haiku Maui in 1979. The location was perfect because it was a place with giant waves and one of the most popular surf-spots of the world. As time progressed, the range of fruits expanded and the action-sports label established itself world-wide as one of the top trademarks for windurfing and surfing. In the meantime the brand has established itself in further extreme- and fun sports activities just as skiing, snowboarding, biking, kitesurfing and skating. Due to the perfect location in Haiku, Maui the company could maintain very close contact to many surfers and windsurfers from the start. These sports maniacs provided a valuable contribution to the continuous development and successful establishment of further Dakine products. New products were tested immediately and checked for durability and quality. Due to this process the Dakine products established themselves to flagship products of the sports industry. With the help of ambitious sportsmen, Kaplan set new standards for surf equipment. Dakine quickly has risen up to become a cult brand. At that time like today Dakine convinced with power, best wearing comfort and durability – always in combination with quality, cool designs and great color schemes. 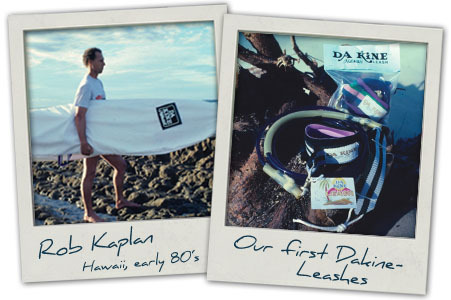 Early pictures show: at that time Kaplan and his Dakine crew were great fashion professionals! However, today not only windsurfing and surfing equipment is tested by pros. In the course of the years pros of different kind of action sports-activities like kitesurfing, skateboarding, mountainbiking, snowboarding and skiing were involved in the development. The brand name Dakine has its roots in the Hawaiian island Maui and is pronounced [:dakein:].It is a Hawaiian slang word and „DaKine“ means “thing” and in a broad sense it means “the best” what it is correct for the quality of Dakine products. There is a good reason for the positive attitude and self-awareness of the brand because within shortest time Dakine become a top brand for windsurfers and surfers. More and more new products like board bags have been added and made the range complete. 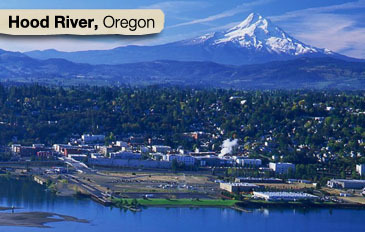 In 1986 the company expanded to the North American mainland in Hood River, Oregon. This is well-known as a Mecca for surfing, outdoor, adventure and mountaineering. After that nothing and nobody could stop Dakine. The company achieved worldwide recognition and more and more products were developed for other sports. 2011 Dakine entered winter sports business with selling snowboard equipment and again attracts attention trough a distinctive design. The company established specific backpacks for variant extreme sports on the market and could develop rapidly. Rob Kaplan has still a leading position in the leisure segment on which Dakine also has big parts. The Dakine Shop is the biggest online shop of Dakine worldwide. It offers customers a big selection of the whole product range of snow wear, gloves, functional underwear, surf trapezes and bike supplies but also casual streetwear and accessories. Jason Fischer is the managing director of Online-Shipping. 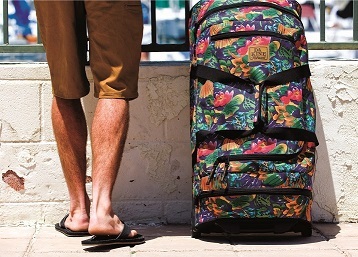 Besides sporty brand strategy, Dakine also stands for its big range of backpacks, schoolbags, handbags and streetwear. Dakine stands for top-quality, extraordinary functionality paired with trend and fashion-consciousness. The design of the beloved rucksacks and bags change from collection to collection. It never stands still. Instead of holding on the proven color samples, the label has the courage to embrace change. For that reason each collection is different to the former range of products and always offers something new. Even after 35 years Dakine is and remains a versatile and exiting label which is still convincing! Product expansions and improvements are reflecting the special character of the cult label. The official Dakine Shop is the most reliable source for new and improved Dakine products worldwide. In the meantime Dakine is represented in many sports: ski, snowboard, bike and kite, windsurf, surf and skate. Each of these sports activities is characterizing the sense of freedom and independence. Dakine supports extreme sportsman by providing high-quality and extraordinary functional products. The requests of the athletes are taken seriously and constant evolution of the products distinguishes this company. However, not only grown-ups can benefit from high-quality and stylisch products. Also kids have a wide range of products in the Dakine shop and will not have to do without cool style fashion. From sophisticated winter sport rucksacks to waterproof gloves or trendy caps but also high-quality functional underwear - everything is available. Whether small or large, everybody can count in Dakine. The official Dakine Shop offers the right product for everybody! Dakine teamrider play an important role for the brand. Today also, like then in Haiku, Maui, products of Dakine are tested by young athletes. The sponsored teamrider play a crucial contribution to the label. They are the one who are testing the products under the most stringent conditions. Dakine, of course, does overhaul its products if the products are not fulfilling the requirements of the pros. The brand again shows its flexibility and adaptability! Only through good and constructive cooperation Dakine has gained a reputation as a premier brand. To live the philosophy of Dakine it is not necessary to be an extreme sports person. Thanks to broad range of leisure your everyday life takes in a new glory and joy. From trendy backpacks, fashion-conscious bags for girls and women or cool shirts and caps - everybody will find what he is looking for. The burden of school days or stressful exams at university – this can be quite annoying. However, if you go through this while wearing a Dakine rucksack or bag it may not be that bad! The colorful designs and fresh pattern of the Dakine collection have a great energy and spirit that is simply a joy. Of course: it is just a simple backpack but it’s offering you the certain “special” while wearing it. A Dakine bag stands for joy if life and optimism and it will not let desert you! When you feel a bit claustrophobic at home it is time to get out. Holiday is very important to gain new energy. Dakine understands this basic need and attaches great importance to perfect travel-equipment. From carry-on bags for a short trip to a spacious Dakine trolley for extended trips in foreign countries. Also these products will cover any taste and for sure there will be the right choice for every occasion. Girls who want to feel like ladies some time a year, there are high-fashioned travel sets which combine luggage, handbag and toiletries in one design. You can look forward to a truly special vacation and do not have to make your mind. The Dakine travel products care about organization. You just have to relax yourself. Please benefit from more than 40 years of experience in the production of sports articles and rucksacks! Dakine specialized in extreme and board sports like surfing, kiting, windsurfing, surfing, biking, skating, skiing and snowboarding. Our products are frequently being developed and modified so they are always up-to-date. Also professional athletes are focused on the powerful cult brand of Hawaii. The international trendy brand stands not only for sports but it is mainly known for backpacks, rucksacks and school bags. However, a Dakine pack does not only carries schoolbooks, every-day things or sportswear but it communicates a message. It is individual and it is very much in line with the trend. It has style – like its carrier. Dakine is convincing trough functionality and high quality. In the official Dakine Shop you will find everything centered on the brand: bags, luggage, sports equipment or streetwear for men, women, girls, boys and kids. Dakine offers versatility no other brand can offer.